One out of three homes in the United States has a pod-based coffee machine. However, while pods like K-cups make it convenient to prepare your caffeine fix, it also poses serious environmental problems. 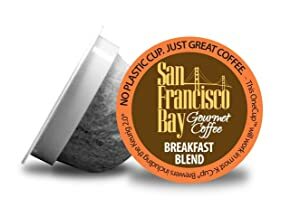 Even the man who invented K-cups expressed his regrets, noting that he did not expect it to become a household name and to generate tons of plastic waste. In recent years, Keurig has been the subject of protests among environmental advocates, noting that it is high time for the company to reconsider the impact of their products. If you are concerned about how your action impacts the environment, it is time to let go of your regular Keurig K-cups. Instead, consider more sustainable alternatives. There are already coffee pods made of eco-friendly materials. Looking for the best biodegradable K-cup? Keep on reading and we’ll let you know some of the best products to consider. What Makes a K-cup Biodegradable? First, let us quickly define what exactly is a biodegradable K-cup. 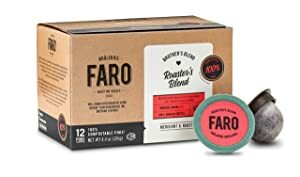 As the name implies, these are K-cups that are made using biodegradable materials, making it a better option if you want to do something good for the environment. 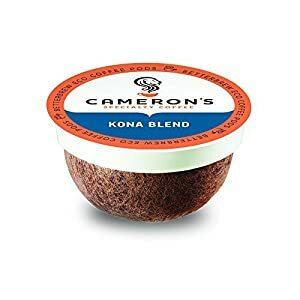 When a K-cup is biodegradable, this means that the material can be broken down into small components by living micro-organisms in the absence of causing any harm. However, this can be quite tricky. While products are labeled as biodegradable, it is not indicated how many years it will take before it can fully decompose. K-cups used to be made of #7 plastic, which is not accepted in many of the recycling facilities, which is why they end up as plastic waste. For many people who are uninitiated, it is easy to be confused with the way products are named. Some of you might think that recyclable and biodegradable are one and the same, when in fact, there are significant differences between the two. When you say that the packaging is recyclable, this means that it can be reused in many ways. The number of times it can be recycled will depend on the materials that are used. In contrast, a biodegradable K-cup means that it can break down into small components. So, which one is better? Both are actually good for the environment compared to the traditional K-cups. Recyclable packaging is preferred by many because you can use it in several ways as you please. This is as against biodegradable packaging when there is a need for a green waste collection program from where you live or a compost pile. For years, Keurig has been the subject of protests among green consumers who are looking for the eco-friendliest way to enjoy their coffee. To date, they still do not have K-cups that are fully biodegradable. In 2014, if you placed Keurig K-cups next to each other, it will be enough to circle around the globe for 10.5 times. Sadly, all of them end up in landfills since they are not recyclable. The packaging is not sustainable, and therefore, it is easy to understand that it is indeed killing the planet, and worst, you may be part of it! It was in the same year when Keurig finally stepped in and expressed their commitment to making their K-cups 100% recyclable by 2020. The first country to adopt the program is Canada. Although, on a global landscape, it is expected that the target of 100% recyclable K-cups will be reached by the end of 2020. Despite these radical moves, however, there are some people who believe that it is too late. The business model has already proven to be unsustainable in the past years. The problem already seems to be irreversible. Before we proceed to our discussion, let us first have a quick look at what can be done to recycle your K-cups and do something that is good for the planet. A lot of people have misconceptions that without a proper recycling facility, the K-cups just have to end up in the trash. Truth is, there are ingenious ways by which it will be possible to have them recycled. Before recycling, the first thing that you need to do is to clean the K-cups. This is quite easy. Start by opening the lid, throw any remnants, wash, rinse, and dry. The hardest part would be separating the different parts of the K-cup. With this, you can purchase a separator, which will allow you to separate the three layers and recycle them individually as needed. The coffee grounds and the paper liner can be useful when it comes to composting. The foil lid, on the other hand, can be combined with other aluminum products. For the plastic part, you can consider having it upcycled instead. Ready to start your search for the best product on the market? Below, we will list down some of the products that should be on your radar, as well as the reasons why they are exceptional choices. 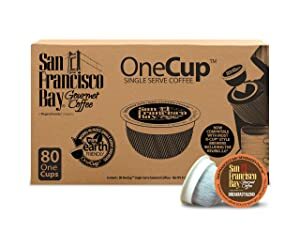 San Francisco Bay has gained a reputation as one of the most popular manufacturers of earth-friendly K-cups and this blend is their best-seller. It will work with Keurig 2.0, as well as most models of K-cup style brewers, including those from brands like Cuisinart and Bunn. Its biggest asset is perhaps its flavor, making it possible to provide a gourmet caffeine fix at the comfort of your own home. From the first sip, you will feel like it has been prepared by an experienced barista without the effort. It is made using beans from South and Central America. The company takes pride in choosing only beans with superior quality for the best flavor and aroma. The coffee is made of 100% Arabica beans, so you can expect a full flavor but without pronounced bitterness. It is rich and robust, perfect for those who crave for something that is strong but never overpowering. For a coffee to be called Kona, it must be made using beans that have been cultivated exclusively in one of the best coffee regions in Hawaii. This blend does exactly that. Because of this, you can expect a distinct flavor that is hard to match by coffees from other regions. The most noticeable would be the chocolatey and nutty flavors in every sip. The best thing about their pods is the fact that they are not made of plastic. Instead, it is made using a real coffee filter. It is certified compostable, although it should be noted that it needs to be processed in a certified facility. The manufacturer makes sure that attention to every detail is given during the production process. In fact, it is made in small batches to have an assurance that quality is never compromised. To add, their coffee is also free of allergens and GMOs. In terms of compatibility, you can use it with Keurig 2.0 brewers. For a coffee with an exquisite taste that is also good for the environment, make sure to include this on your radar. The packaging is 100% biodegradable and compostable, which makes it better compared to your traditional K-cups. It does not contain any plastic part. They will degrade and add nutrients to your soil. Another reason to choose this product is the fact that it is Rainforest Alliance-Certified. The beans used are grown without using agro-chemicals, resulting in the best flavor possible. Speaking of flavor, it is deep and dark. Caffeine has been washed off, so there will be no palpitations or other side effects commonly associated with drinking coffee. 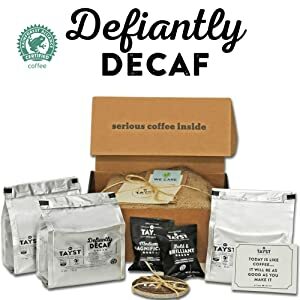 Despite being decaffeinated, however, you can expect that the flavor remains full. This medium roast coffee comes with a well-balanced flavor for the right amount of sweet and bitter in every cup. It allows you to enjoy the best of both worlds in your drink. It has a fresh aroma and a fruity flavor that is sure to tickle your taste buds. The manufacturer boasts that their coffees are hand-crafted in small batches by trained people. They have the eye for great beans, making sure that you will enjoy nothing but the best. Special kettles have also been used in the roasting process. The lid on each coffee pod is made of compostable materials, mostly paper. On the other hand, the ring uses coffee bean skins while the filter is plant-based. The combination of these materials shows that it is indeed good for the environment. With the design of the lid of each pod, it is compatible with 2.0 brewers. 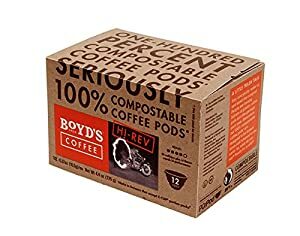 With the 100% compostable packaging of this coffee pod, you can significantly lessen your environmental impact as this means that it will incur zero waste! The company takes advantage of an innovative technology that allows them to create packaging that can transform into usable soil within just 8 weeks after its disposal. While it saves the planet, it also gives your taste buds a treat. They use beans that are consciously-sourced. Meaning, aside from the environment, social impacts and economic sustainability are also highlighted by the company. With their meticulously-selected beans, you can expect nothing but premium flavor and aroma. This specific variant, The Knight, is known for being a dark roast, resulting in a robust and full-bodied caffeine fix. These coffee pods are compatible with all models of Keurig coffee machines. The name in itself will already compel you to have it chosen. True enough, this is ethical coffee, so you can be sure that you are doing the environment something good if you pick it over others. It is made using renewable materials, making the pods 100% compostable. Aside from being compostable, the pods are also organic and FAIRTRADE certified. One pack contains 12 coffee pods with a classic medium roast. It is made using seasonal arabica beans that have been sourced only from the best plantations in the world. The beans were grown in Central and South America. These are places in high altitudes to provide just the right acidity in every cup. 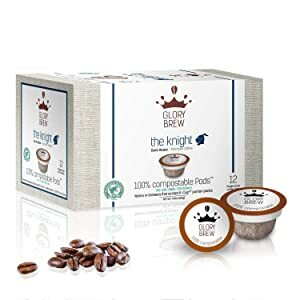 These coffee pods are compatible with all Keurig 1.0 and 2.0 brewers. This is a coffee made of 100% USDA Organic Arabica coffee beans, which means that you can expect a strong caffeine fix but without being overwhelming. It is made using beans from South America, providing it with a vibrant flavor. The coffee is well-balanced and is smooth on the mouth. 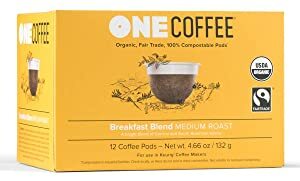 Like most of the products that are mentioned in this post, it is 100% compostable. It is also Halal and Kosher-certified. The grind size of the coffee is also perfect, providing an assurance of the perfect extraction. You cannot see the exact grind because they are housed in a pod, but the company makes sure the grind size is optimized for the best brew. The coffee pods are compatible with Keurig 2.0 brewers, as well as with those from Hamilton Beach and Cuisinart. 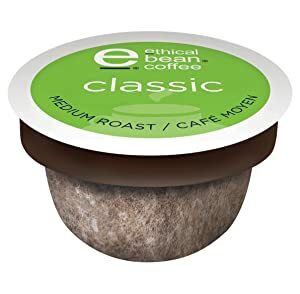 With certifications from both Vincotte and BPI, you will be happy to know that this is another great option for coffee pods that are certified to be compostable. Nonetheless, take note that the manufacturer explicitly states that the packaging is not for home composting. The beans are sourced from the best farms in the world. They are from small farmers, allowing the company to make a huge social impact in the lives of those who work to deliver premium coffee to consumers. Most of these farmers are in South and Central America. More so, the Fourth Wave Blend is made Arabica beans that have been hand-picked from Honduras and Peru. In terms of flavor, it is rich and smooth, which can be attributed to the fact that it is a medium-dark roast. The pods are compatible with Keurig and Keurig style machines. This is the second product from San Francisco Bay that has been mentioned in this post, which shows how the brand is indeed a trusted name on the global market. The best thing about choosing this over others is the fact that it comes in a variety pack. Meaning, in one packaging, you can enjoy multiple flavors. There is surely one that will tickle your taste buds. To be specific, one box contains 20 each of the following flavors – Donut Shop Blend, Hazelnut Crème, Breakfast Blend, and Espresso Roast. Based on the opinions of the people who used these coffee pods in the past, one thing that they liked is how it does not contain milk or artificial sweeteners. This means that you will enjoy an unadulterated flavor in every cup. Your coffee will be as pure as it can be. Want to taste a rich coffee with a full flavor that is also good for the environment? This coffee from Boyd’s wraps up our list. Its pods are also 100% compostable, so they do not have to end up as part of the tons of plastic waste. Aside from being eco-friendly, another good thing about the packaging is how it is packed in a sealed foil pouch, which will allow freshness to be retained. It cannot be penetrated by air and other external elements that could possibly have a negative impact on its taste. With the construction of the filter pods, the coffee grounds will be completely saturated by water, which will lead to a fuller flavor. It is compatible with almost any coffee maker that accepts individually-packed coffee pods, except for Keurig 2.0. Be an advocate for a greener world. Start by changing the way you enjoy your coffee! Get rid of the plastic waste, and instead, consider using the best biodegradable K-cups, including those that have been mentioned above.